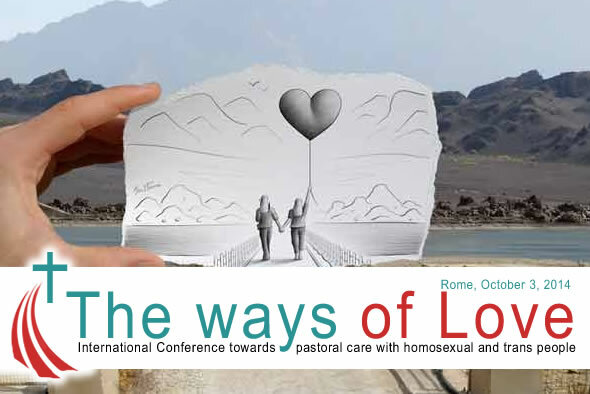 The Extraordinary General Assembly of the Synod of bishops in October 2014 offers Italian homosexual Christians the opportunity to accomplish a Copernican revolution: there will be a shift from a situation where the outcasts and the hidden were hoping and waiting for something to happen, for someone to change their pain, to one where hope becomes action and they refuse to be closeted because they are aware that their lives are as worthy and full as anyone else’s life. Their testimonies can bring all sorts of communities to reflect together so that at the Synod a new pastoral care is conceived ‘with’ homosexuals and transexuals. The question Pope Francis asked himself ‘Who am I to judge gay people?’ has become a healing balm for a lot of people and it is so powerful that it can produce real change. A suspension of judgment is indeed not enough. It needs to inspire the Christian community with welcoming, encouraging and respectful feelings towards homosexuals and transexuals, who long for a complete life, as all the castaways still do nowadays.The new comforting hope for homosexual and transexual Christians all around the world is Jesus’ 2000-year-old project of liberty and humanity: people should be looked at through the eyes of the heart and not judged by the law because all people, especially those left behind, are entitled to walk with their heads held high, with confidence and dignity. This hope has generated voluntary, but hectic and enthusiastic activity from Catholic homosexuals around Italy who have produced contributions and proposals for the new pastoral care that will be conceived at the Synod. It is a contribution that originates from personal experience and, therefore, that wishes to set out the cultural and structural factors that throughout LGBT people’s lives (from birth to adulthood) still thwart the possibility of a peaceful and constant presence in their community. These proposals contain hopes for an inclusive and a prejudice-free Church for all, including homosexuals and transexuals. This collection of contributions and proposals suggested by Italian homosexual and transexual Christians will be available in its full version but also turned into an appeal to the Extraordinary General Assembly of the Bishops’ Synod and presented at the end of the conference ‘The ways of love’.